Product #1636 | SKU HI5-3D | 0.0 (no ratings yet) Thanks for your rating! The Hi5-3D is a 3D video multiplexer that combines two 3G or HD-SDI Inputs into various multiplexed 3D formats for output on HDMI 1.4a and HD-SDI. The HDMI 1.4a output supports EDID transactions that allow automatic 2D/3D configuration per the HDMI monitor's capabilities. Input SDI 2 will be frame synchronized to input SDI 1 in 3D Modes. Embedded SDI input audio is embedded in both the HDMI and SDI outputs. 2 channel RCA audio output is also supported with user control of channel selection. 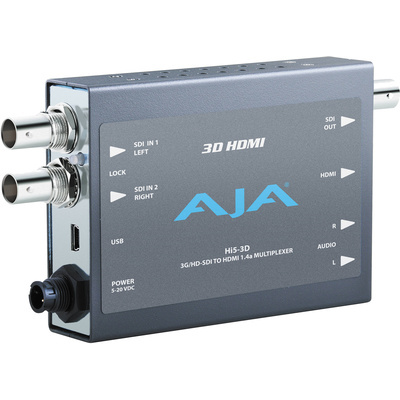 The Hi5-3D supports AJA's Mini-Config application for user configuration and firmware download. The Hi5-3D supports, depending on the video format, "side-by-side", "top-bottom", and "frame- packing" 3D modes. The "side-by-side" and "top-bottom" modes involve compressing, either horizontally or vertically, each input for combining into a single video stream at the same rate of the inputs. The "frame-packing" mode stacks two full resolution inputs into a "tall" frame (at twice the clock and line rates). When selected, "frame- packing" can only be used with 23.98/24Hz input frame rates. "psf" inputs are converted to "p" for HDMI output. The SDI output can support S/S and T/B formats only. Future software versions may add other frame rates. The Hi5-3D supports both dipswitch control and host control via the Mini-Config application. One of the dipswitches is a "Local/Remote" switch. When in the "Local" mode, the remaining dipswitches support a subset of the user controls. When in the "Remote" mode, AJA's Mini-Config application controls the unit (or control as last set).